Elizabeth Moore Willingham is Associate Professor in the Department of Modern Foreign Languages at Baylor University (Waco, Texas). She has published on Latin American women’s fiction, Laura Esquivel’s fiction, Medical Humanities, Historical Language, and Medieval Miracle and Arthurian literature. She has served as president and executive director of the Southwest Council of Latin American Studies. She is series editor for The Lancelot of Yale 229 (Brepols) and volume editor for Essays on the Lancelot of Yale 229 (2007) and editions of La mort le Roi Artu (2007) and La Queste del Saint Graal (2009). The Agrauains edition, supported by the National Endowment for the Humanities, is to be published in 2012. Outstanding essayists in Latin American literature and film explore Laura Esquivel’s critical reputation, contextualize her work in literary movements, and consider her four novels and the film based on Like Water for Chocolate from diverse critical perspectives. The Editor’s “An Introduction to Esquivel Criticism” reviews twenty-years of global praise and condemnation. Elena Poniatowska, in an essay provided in the original Spanish and in translation, reflects on her first reading of Like Water for Chocolate. From unique critical perspectives, Jeffrey Oxford, Patrick Duffey, and Debra Andrist probe the novel as film and fiction. The Reverend Dr. Stephen Butler Murray explores the author’s spiritual focus, and cultural geographer Maria Elena Christie uses words and images to compare Mexican kitchen-space and Esquivel’s first novel. Elizabeth Coonrod Martínez and Lydia H. Rodríguez affirm divergent readings of The Law of Love, and Elizabeth M. Willingham reads contested national identity in Swift as Desire. Jeanne L. Gillespie and Ryan F. Long approach Malinche: A Novel through historical documents and popular and religious culture. In the closing essay of the volume, Alberto Julián Pérez contextualizes Esquivel’s fiction within Feminist and Hispanic literary movements. A glossary and translations recommend the work to English-speaking readers and those new to studies of Hispanic fiction and film. This book is the first in-depth review and assessment of twenty years of Esquivel criticism. The comparative and theoretical views presented of each of Esquivel’s four novels and the film of Like Water for Chocolate provide suggestions for future literary research. This collection of essays on the work of celebrated Mexican writer Laura Esquivel provides a broad overview of her literary and cinematic production and suggests new approaches for analysis of her work. The introduction provides a detailed summary of existing scholarly investigations and will be especially useful to researchers. Suggestions for future directions in Esquivel criticism reflect contributors’ diverse fields. Essays highlight, for example, the retelling of Mexican and women’s history through the optic of a past linked always to the present; women’s critical role in the survival of communities through food preparation, knowledge of ecology, and natural healing; character traits when gender roles are reversed; tension between Catholic traditions and indigenous spirituality; women’s confrontations with collective and individual trauma; and the importance of knowledge production located in female-gendered domestic spaces responsible for familial, community, and national cohesiveness (the last a particularly understudied subject). In contrast to the volume’s celebration of Esquivel’s achievement is its final essay, “Esquivel’s Fiction in the Context of Latin American Women’s Writing,” in which the author deviates from the essay’s implicit goal by expressing his own discomfort with feminism in general and Esquivel’s rewriting of gender roles in particular. Summing Up: Recommended. 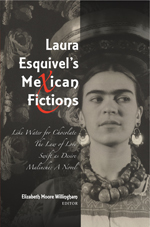 Elizabeth Moore Willingham organized this edited collection of essays on the four novels of Mexican author Laura Esquivel no doubt aware there existed no other book of criticism exclusively devoted to Esquivel’s works. Her novel Como agua para chocolate is given particular attention in an article dedicated to scenes of storytelling in the novel (Yael Halevi-Wise) and in another about feminist views of kitchen tales (Maite Zubiaurre). There is already an impressively extensive list of articles published about this first smash hit of Esquivel’s, which quickly became a world cinematic phenomenon. Laura Esquivel’s Mexican Fictions will most likely be in demand if for no other reason than that scholars pursuing critical guidance on any or all of Esquivel’s four novels will find no better source, all in one place, than this volume of fourteen articles.